Home » Musings » Welcome, Readers from Her World Malaysia! Welcome, Readers from Her World Malaysia! So Welcome, if you have stumbled on my blog via Her World Malaysia (I’d have welcomed you earlier if I’d known about this before). Do check out the product reviews or the archives and if you’re up to it, do say Hi here in the comment box 😀 I’m dead chuffed as you can tell and I hope you enjoy your visit. PREVIOUS POST: Your Say: Are Beauty Bloggers supposed to be all young and/or beautiful? Congratulations! Did you go omg, then OMG then OMFG!!! LOL =) Good on ya! Thank you Lily 😀 actually I think I went WHEEEEEE!!!! Like a fire engine lol!! Yaaaaaay, recognition! 🙂 So happy for you! That is awesome! You DO do Malaysians proud. Congrats. Oh man, that was so sweet! I should be made a mascot or something? 😉 thank you! Congrats Paris! Glad to hear the good news! Keep up the good work! Thank you, Lavender and I think I spotted you as a product reviewer too! Congrats again Paris! It’s been such a pleasure reading you (and have you comment on my blog? That’s just mind-blowing)! Woohoo! Coolness PB! Keep up the good work…..
Sweet! Congratulations 🙂 This is all the way up there in terms of the coolness factor. 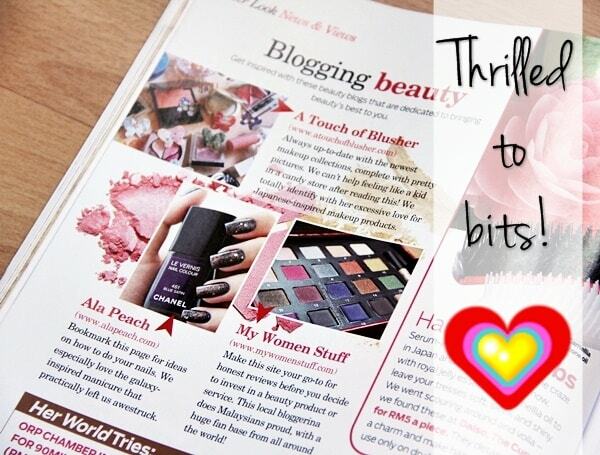 And congrats to Peach too – can’t think of any other nail blog that deserves the mention as much as hers. Teehee thank you Nia! I don’t even know how they came up with that lol! You deserve this, and I like your blog and the topics 🙂 Congrats! Aww Thank you so much Samantha! Now that you’ve started commenting, I hope you’ll come back and join in our conversations 😉 as you can tell, it can get lively in here!